This is the basic recipe. It will fill a 10 inch pie plate and you can use the almond meal crust from the main Cheese Cake Recipe. I used 6 Ramekins for individual servings. They are each one Cup. I filled each 3/4 of the way. Topped with Whipped Heavy Cream. This is a really great, easy to make, Low Carb dessert. Note: Instead of the Cinnamon, Ginger and Cloves, you can use 1 3/4 tsps of Pumpkin Pie Spice. It will give a slightly different flavor. Soften the cream cheese and add all ingredients into a mixing bowl. Hand mix until evenly distributed. Then use a Hand Electric Mixer to beat the ingredients smooth with no white spots of un-mixed cream cheese. 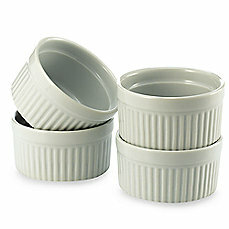 Pour into the Ramekins to 3/4 level. Place on a baking tray. Heat oven to 425 degrees and place the tray in the middle level. Bake for 15 minutes. Then reduce the heat to 350 degrees and bake for another 30-40 minutes. They are done when a knife inserted in the center comes out relatively clean. Don’t over cook and dry them out. If in a pie tin, it may need closer to 50 minutes. Let them cool, then put in the refrigerator to chill. Top with Whipped Heavy Cream. I add a splash of Vanilla and sweetener when it is about half way whipped. Sprinkle with Cinnamon.